I know, I know, why ask this question, right? Well jst the other day, I was sitting next to my GL, and looked at the suspension really close. I measured the springs, both front and rear, compressed and extended, and thought to myself..."Has anyone ever tried to bag one of these things?" I was just wondering, because it seems like an easy thing to do. And for the Low and Slow VW guys, I think it would be killer. So, to my question, has anyone done this, sucessfully, had issues with travel, ride etc. This would be for a show and go thing. Jsut a good old question to ask. Not sure it's worth the fab time. Adjustable load capacity is really the only advantage. Unless you're one of those guys who wants drop it on the frame. Here is the rear of my van. I use it so I can level the van when I put the dirt bike on the back. The front would more difficult, the shock must be relocated. My fabricator just finished the air ride setup on my Syncro Tristar mainly for the purposes of being able to lower it to fit into my garage at home and at work and truthfully it is one of the coolest things I have ever seen. 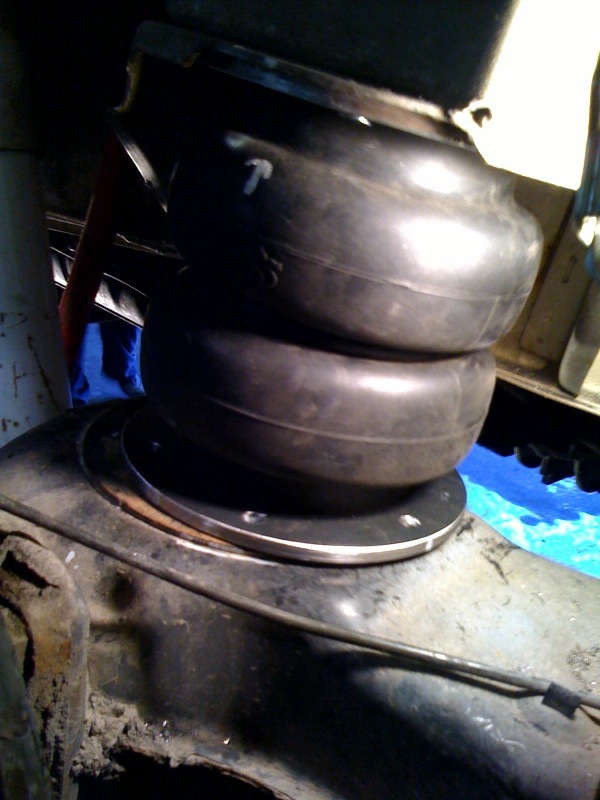 We had to relocate the front shock mounts and obviously make new "spring" mounts for the bags both front and rear along with running the tubing, installing the valves and switches and then locating the two tanks and two air compressors up high in the treasure chest out of the way. That combined with Porsche 930 constant velocity adapters and axles will actually increase the amount of overall travel in the rig. Certainly what you have to come to grips with is to choose a relatively narrow window of height where the truck/van will normally travel so that you can get the alignment correct and then just use the travel above and below that for extreme circumstances. On the setup I have devised I used a simple switching box that allows adjustments of each individual corner along with the ability to raise the front suspension independent of the rear and vice-versa... along with a central switch to raise and lower everything. The BIG jump in money is when you go to a dedicated air management setup to monitor all of the individual switches via PSI (there are six valves and six switches in my setup fyi; one per wheel and then one per "axle") to create a balance and an electronic measurement that will allow you to pre-determine where you want the truck to sit. We took a measurement of the chassis ride height prior to doing the air ride to determine where the chassis should be at normal state and will align and balance to that height. I will just have to get it close to that height upon adjusting it upwards or downwards. I'd like to see pics of your setup very much. Sounds like quite the setup - the whole rig, not just the air suspension. Since air bladders have different characteristics than the steel springs, I'll be interested in what you end up with for shocks as I'm sure the final choice will depend on how the air springs behave. Nice direction. you don't need an outboard shock for the front, there are bags available with a shock through the middle. even shocks with adjustable compression and rebound. I think I'd like to do this too, but it's not high on the list and it's expensive for vanity's sake. Thanks Doug, I appreciate it. Since the normal operating range for my rig will be + or - 2-3" away from stock we are able to use some off-the shelf Bilstein HD's that are going to be not too different from stock which will keep the costs down. The other factor that most people (including myself before taking on this project) don't realize is that with air ride you need less shock than a steel spring to maintain proper control of the ride.. or less dampening overall which makes things a bit easier. You also lose a lot of the mechanical noise and harshness of the steel springs when you go in this direction. Granted, you pick up a ton of complication overall but with a solid installation the whole thing is pretty reliable. I've got a little different challenge for the air suspension brains here. My father is in a wheelchair. Now, he can walk, though not far and not without crutch-canes, but he can and does walk. Presently he's rolling a 99 Toyota Sienna. He has the rear seat out with the 2/3 seat in the middle still in. At the rear of his van, he has a loader that extends out and down to the ground, he gets out of the chair, and the loader lifts the chair into the back of the van. So what we're thinking of is a bagged Vanagon with minivan-ish ride that has the ability, like a city bus, to kneel at the front and back. The vehicle will never change height while underway, and only needs to go up and down as a unit without fancies like side to side, or front to back proportioning. Is this a reasonable mod? He's currently on the road with my mother to Maine from Philadelphia and will likely rollover 230k on his Sienna. (A little thing like a disability does trouble him. He just engineers around it.) So he put me on to researching the use of a 'kneeling Vanagon' instead of flushing a vast amount of money into a brand new car that he frankly doesn't want. 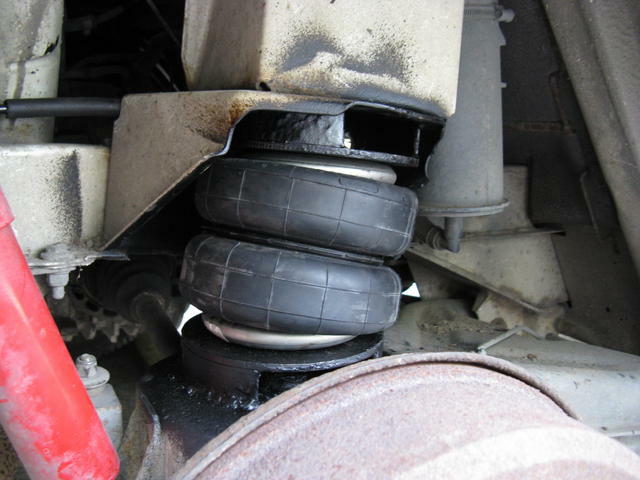 the limiting factor in the vanagon is the way the driver sits on top of the wheel well, the tire cant go up as far into the heel well as on a car or van like the Sienna. The thing to do would be to measure how far it is from the wheel well to the tire, if the van rests on the tire is it low enough for him to transfer into the drivers seat? It is easy (technically) to set up air ride to lower the van down to the limit of the frame and suspension and then go back to a preset ride height. Trouble with the van is its seat height is normally much higher than other vehicles. Eurovans are more commonly set up for wheel chair lifts, the is one for sale in the classifieds, in the Vancouver area, it could probably be easily imported into the States. I'm in the feasibility phase of looking into putting bags on a syncro. Please post pictures of your build and let us know who your fabricator is as I would like to speak with them. The other choice is the predictable 'conversion van.' My father wants no part of it: "gimp-mobile." We had a lady who went to our church with pretty severe Muscular Dystrophy. That was what she had. My father's condition is similar to MD, it just takes a quarter century to finally kill you. The thing that turned him on to the vanagon is that he has always liked the styling of it (especially the Carat) and what was, at the time, the lowest lift over rear deck in the world for a consumer vehicle. I suppose if I explained the matter of 'the front can only kneel until the body touches the top of the tire' he'll either pass on the idea or decide whether or not that is acceptable. But if the rear can squat right down to the oil pan....that can be a huge win, as the chair lifts are rated based on how high they have to lift the wheelchair. (About 300lbs.) The less lift, the lower the price. I mentioned the Bostig conversion and that really perked him up, so while he's on vacation, I'm running down leads. "Why is there never time to do it right the first time, but there is always time to do it twice?" this bag has an internal bump stop and is mounted direct without brackets, unlike presslab's set up, his is better if you don't need to get low. that tire is the same diiameter as stock so you can judge how low the rear would be. 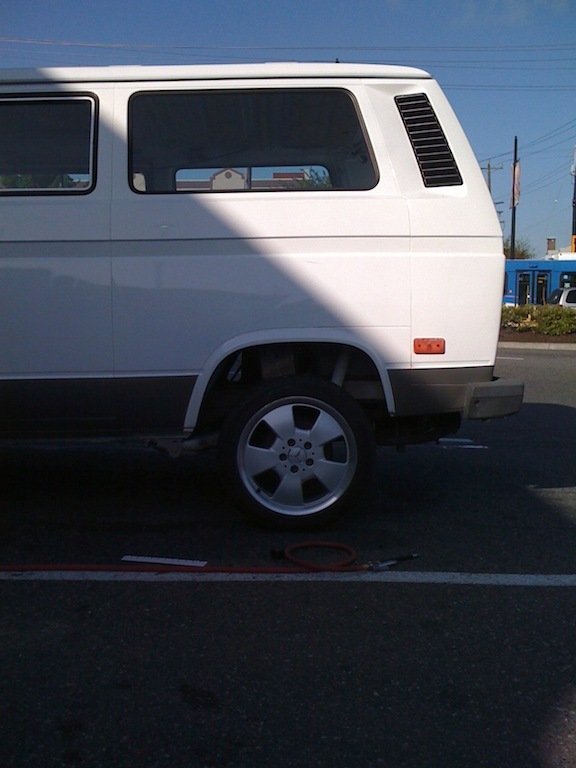 you might also look for a rare vanagon that has a slider on the driver's side, then he can hoist the chair into the spot behind the driver. 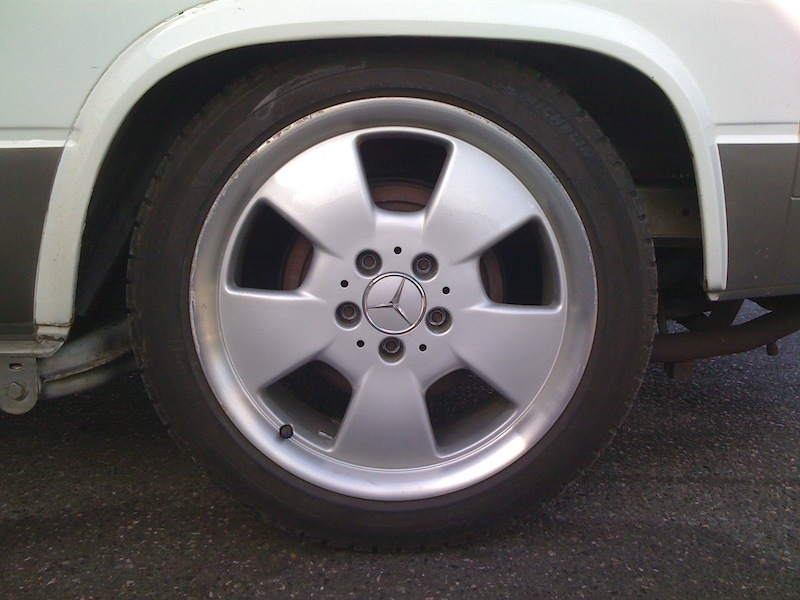 That last pic of the Benz wheel looks like the rear hub is pretty much level with the rear of the wheel well flare. I think I can work out some numbers from there. I tried to sell me dad on using the side door, but he shut me down with good reason. (The man has a degree in mechanical engineering with an emphasis on nuclear safety systems.) His comment: "Its the back door or nothin. If I T-bone some jackass trying to scoot through a red light, I want the center 2/3 seat between me and 300lbs of wheelchair that will be on its way toward me when I cave in the front of the van in a sudden stop." And I had to admit....he had me there. Based on the 'slammed' look in the thread you sent, as long as we ran tall enough tires, he'd be fine. But here's a critical item I can't seem to find for searching: "what is the vertical dimension of the rear door? How tall an object can you put in? (the chair rolls onto a deck and latches and is then lifted up to the liftover level, and then slides into the vehicle.) Vertical clearance is critical. I'll go check out some of streetbeat's gear.